Uncategorized | Does it come with bacon? The last time I was at Issian, the owner Sugi asked why I hadn’t been blogging. This inspired me to start up again, and hopefully, my goal is to blog at least once a month going forward. I figured I couldn’t go back to Issian without putting up a blog post, so here I am. We’re heading there for dinner tonight, and I didn’t want to disappoint! So thanks to Sugi for the inspiration! But before I go into what this post is about, here is one of the most delicious bites I’ve had in a long time (from Issian, of course). 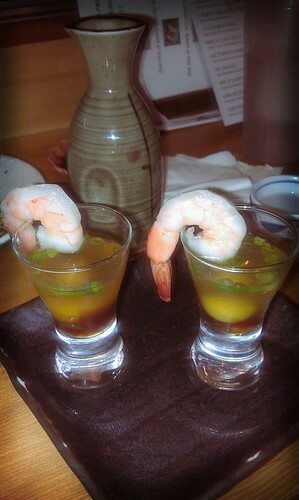 I present to you the Happy Hour Shooter, a shot glass ponzu, quail egg, dashi, and green onions with a shrimp “garnish”. It was so good, we quickly ordered another “round” the last time we were at Issian. And now, to the story at hand. As a way of saying thank you to my sister Shannon for being such a fantastic Maid of Honor, I had the brilliant idea to take her on a Crab Cake Crawl! Crab Cakes are one of her favorite foods (I’m quite partial to them, myself), so I thought it’d be the perfect way to spend a day. Boy, was I right! I won’t go in chronological order, I’ll just start with the best and work my way down. Hands down the best crab cake in Seattle, dare I say the best I’ve ever eaten, is definitely at Palisade. Not only do they have minimal filler, but they are pan fried on one side then oven roasted for a crispy outer layer that gives way to the succulent crab within. They pair it with a salad and a delicate butter sauce. We ate at the bar and since my sister and I were sharing, they split it up without us even asking. I love that! If you love or even just like crab cakes, I’d recommend heading to Palisade immediately (after my first visit a week prior to the Crab Cake Crawl, I went twice within two weeks, it’s that good)! The food alone is worth it, but the view makes it even better! 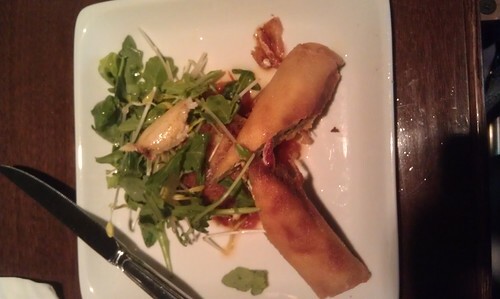 While the crab cake at Palisade was head and shoulders above the rest, the crab cake and accompanying spring roll at Shuckers is a good choice if you are downtown and want a nice crab cake. Shuckers overall has a great menu and the bar experience is a great time (read: good cocktails and delicious complimentary bar snacks), but that is another blog post in itself! Once again, it’s a good choice as there isn’t much filler, so you’re getting as much bang for your buck in terms of crab meat. It is a bit heavier, but the micro arugula and micro bean sprouts (I had no clue they existed prior to this) salad on top balance things out. I think I’d like the dish a lot better it didn’t sit atop the heirloom tomato jam as the flavor from the jam overpowered the other flavors. Since this was actually the last of 4 stops on our Crab Cake Crawl, we opted for the Appetizer portion (one instead of 2 crab cakes), which makes for a good sharable start to a meal. I will say that the 2nd time I ordered their crab cake, there was no claw piece on top and the spring roll was greasy, the crab cake itself was still tasty. The crab cake at Purple Cafe & Wine Bar was okay but not something I’d order there again as they’ve got many other items I like better there. 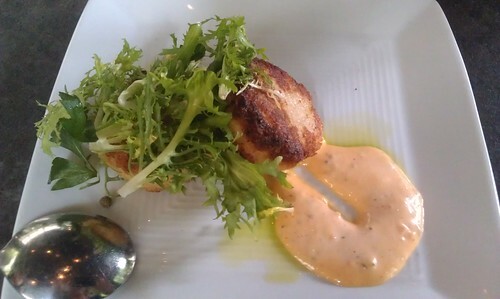 I think had the crab cake not been a bit overdone and the remoulade wasn’t as oily, I would’ve liked it. Oh, and if the salad had been more than just frisee. Yes, it does say that it comes with a frisee salad, but I figured it would have been more than just frisee. 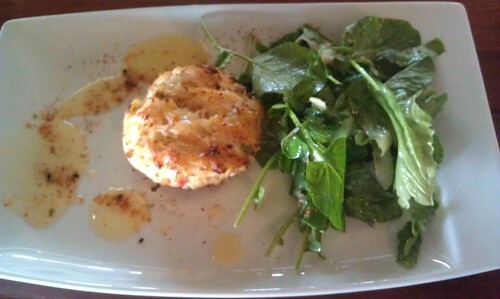 Our first stop was actually at Le Bon Ton Roule in Ballard for a New Orleans style crab cake. While the flavor of the blue crab, which I love, and bay shrimp was fine, the crab cake wasn’t crispy at all on the outside despite being pan-fried and more importantly, the remoulade although quite yummy was way too powerful and heavy, taking away from the flavors of the crab and shrimp. 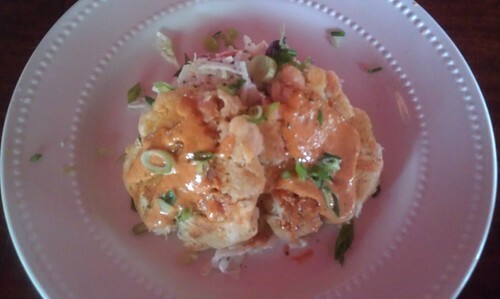 I will say though, it does make me want to try this style of crab cake again, just from somewhere else. Well, it’s timed to head for Issian, I finished writing just in the nick of time! I’ve still got a backlog to post, so fear not! So I am still behind on the blog posting, but I promise I am working on some new posts! However, I do have awesome news, well, a couple of bits of awesome news. I got married recently, so that was pretty exciting! And today I won the Summer in Seattle Giveaway! Thanks to the awesome vendors, I cannot wait to enjoy the rest of Summer in Seattle! Check out what I won! Check out the awesome local businesses on Facebook and Twitter (links below). Perhaps, I will write up a small review of each (someone hold me to this). I know, I know. It’s been two months almost since my last post. I still have at least 4 places to review. I’ll probably be doing a “best of” the past couple of months, and the “worst of” here soon. Between work, heading to Vegas for Labor Day weekend, and spending a week and a half out of the country (Amsterdam for a mini-vacation and Cork, Ireland for a week of work and fun), I’ve not had much time to blog. Hello again, Blog! Hello again, readers! Sorry for the hiatus! So it’s been 3 months since my last blog post. Work picked up and so did everything outside of work. I’ve been taking pictures of meals I’ve wanted to blog about, but I haven’t had the time to sit down and post about it all. Over the next few days, I’ll chronicles those lost food moments – just in time for an awesome event I’ll be eager to blog about this coming Saturday! My best friend Jenn (check out her blog Jenn Dot Com) and I will be attending the Gig Harbor Wine and Food Festival! To get back into the swing of things, here’s a small taste of some scrumptious vittles Jenn and I noshed on at The Triple Door for Tweet Up for Team Up Birthday Bash! back in May. Happy Hour is 4pm-6pm everyday and 9pm-12am Sunday-Thursday, with some great food options (between $2.50-$8) and a variety of drinks specials ($3-$6 cocktails, draft beer, and wine). If I recall correctly, I stuck to the wine – decent pours, they did me well! We started with the Indonesian twice-cooked chicken wings, a dish I hadn’t tried before. 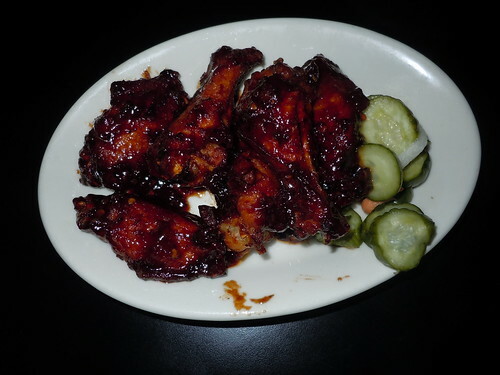 They were quite good – crispy yet tender, salty and sweet, and at $5 for 6 wings something I’d probably get again. Then came the fragrant duck sliders ($5). 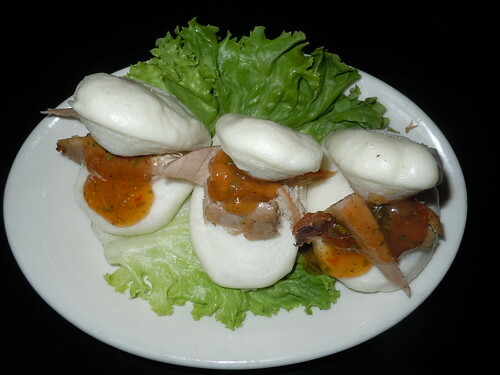 The fragrant duck at Wild Ginger (same kitchen as The Triple Door) is one of my favorite duck preparations, so give it to me already on the bun w/ the plum sauce and I’m all for it. I really didn’t think I liked fruit and meat together until I had the golden plum sauce with the fragrant duck. And the buns, such a perfect soft pillow for the duck! We weren’t quite full then, so we also ordered the peasant’s chicken satay ($2.50). I enjoyed it, particularly the peanut sauce. Their peanut sauce isn’t very sweet (which I like in this case), but full of peanut flavor. 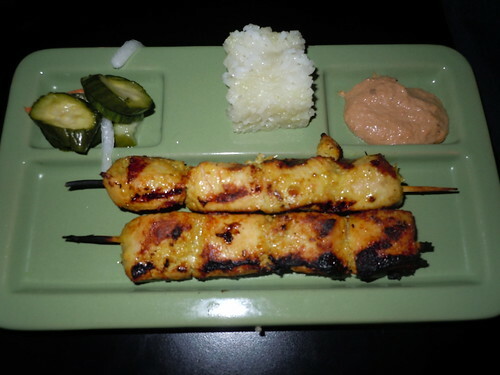 I also really like how the satay always come with the sticky rice! I’d like to go back and try the wild boar skewers during Happy Hour, not sure I’d want to pay more than $4 for 2 skewers. All in all, I’d give Happy Hour in the Musicquarium of The Triple Door another go as I am a fan of the Wild Ginger food and the drink prices aren’t too hard on the wallet! Check them out on Twitter and Facebook. Tomorrow, a look at the happy hour offerings of El Gaucho! So I haven’t forsaken my blog, I’ve just been a bit busy. Mike and I spent a week in Italy (Florence and Venice) followed by a week working in Cork, Ireland. I promise a blog update tonight with a recap of all the delicious food eaten in Italy!